There are several types of loans available to business owners — so many, in fact, that the options can seem overwhelming and confusing, especially to smaller business owners without a lot of experience raising capital. This guide will help educate you on the options so you can make a more informed decision about financing your growing business while limiting added risk. Before we dive into specific financing options for your business, let’s define the two types of funding available to you: debt and equity financing. Debt financing is borrowing money from individuals or institutions to fund your business. This can include funds from family or friends, banks, and agencies such as the Small Business Administration. Borrowing against retirement plans, insurance policies, and other forms of personal equity is another type of debt financing. Loans have varying interest rates and are paid back over time, presumably as your revenue grows. Debt financing, combined with funds from personal savings, is a common funding option for startups. Equity financing, on the other hand, involves investors who take a stake in your business in exchange for funding. These include angel investors, venture capitalists, and sometimes family members or friends who are interested in some portion of ownership in your business. Equity financing is often used once your business has started growing and investors have become confident in your potential for success. Loans are a major source of capital for small business owners. The Small Business Administration (SBA) offers a variety of loans for funding small businesses. Their most popular program, 7(a) loans, can provide funding if you meet the agency’s requirements, including their size standards. If your business qualifies, you can borrow up to $5 million with a 7(a) general small business loan. In addition, the SBA offers loan programs designed for very specific purposes, such as disaster recovery or the purchase of real estate. Your state and local governments may also offer small business loan programs. Keep in mind that collateral—in the form of personal or business assets—is typically required when taking a loan from a government program or an agency like the SBA. Be careful about the collateral you choose to use when taking out a loan; you risk losing it if your business doesn’t make it. Many small business owners apply for loans at a financial institution such as their local bank. Bank loans are convenient and come in a variety of types and options. One benefit of a bank loan is that you won’t have to share company ownership or profits, however you will be obligated to make regular installment payments with interest towards paying off the loan. If you want to keep as much equity as possible when financing your business, a bank loan may be an attractive option. One downside to getting a bank loan is the lengthy application process. When applying for a business loan through your bank, you’ll need to know your credit history and provide a solid business plan and financial report. Finding a trustworthy, business-savvy banker to work with you while launching your business is a great idea. Choose a banker who is local, so you can meet with them face-to-face as often as you need, and one who is supportive of your vision for the company. An accessible banker who has the expertise to advise you on your financing strategy is a valuable asset. Many small business owners look to friends and family for “launch money” to help get their new company up and running. If a friend, parent, or sibling has expressed an interesting in supporting your startup, there a few things to consider before accepting this type of loan. If your family funder wants to become a minority stakeholder in your business, be sure to discuss with them the risks associated with investing in a small business. If you both agree on the specific terms of the loan, make sure you have your attorney draft a formal, written agreement. It’s also important to note that taking loans from family and friends can place a strain on your personal relationships. Before proceeding, think about the implications your successes or potential failures may have on your personal relationship with the investor. If your 401(k) plan has a loan provision available, your retirement plan can be a tempting source of short-term funding for your growing business. However, keep in mind that if you’re looking for long-term financing, a low-interest bank loan may be a more viable and less-risky option for your business. 401(k) plans are designed to help you grow your assets and save for retirement, so consider the potential consequences of borrowing from your plan if your business doesn’t make it. By definition, grants are somewhat different from loans. Grants don’t require collateral like loans do, but they tend to be smaller. Local and state organizations typically offer grants for specific purposes or kinds of businesses, such as those located in economically disadvantaged or rural areas, or minority-owned companies. However, don’t let the idea of a grant mislead you when you’re deciding how to finance your business. Many grants can be very similar to business loans and should NOT be thought of as “free money.” Visit www.grants.gov for more information about small business grants available to you. If your business is in its very early stages, you are not likely to encounter angel investors who are confident enough in its potential to invest. 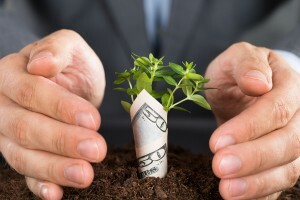 However, if you have a good track record and are growing rapidly, business-savvy investors such as these are a potential source of funding to maintain growth and keep things running smoothly. Angel investors and venture capitalists offer value to your company in two forms: money and expertise. They can give you much-needed capital and reliable business advice, but it does come at a price. These investors usually require a stake in your business, and for larger amounts of funding, you’ll have to trade more equity. Crowdfunding is a relatively new, unique, and often successful way to gain investments from a large number of people. Crowd funders typically contribute small amounts of money on an online platform. There are two primary types of crowdfunding: equity and rewards crowdfunding. Equity crowdfunding involves the backer receiving shares of the business in exchange for their monetary contribution. Rewards-based crowdfunding involves entrepreneurs pre-selling their product or service to interested investors, without trading equity or incurring debt. Crowdfunding platforms such as Kickstarter and Indiegogo may be valuable financing options for your business if you’re in the early stages of launching.